Aiken, SC—A graveside service for Miss. 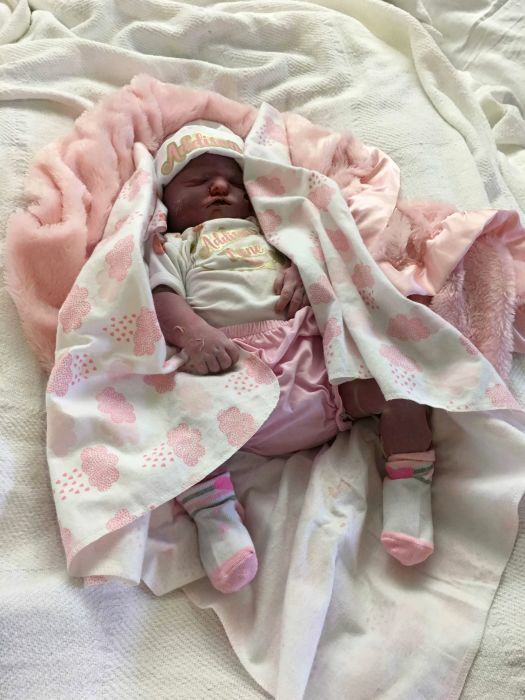 Addison Irene Bledsoe infant daughter of Jamey and Amanda Abney Bledsoe will be held 3:00 pm Thursday March 21, 2019 at Mt. Calvary Lutheran Church, Ridge Spring SC with Pastor Josh McClendon officiating. Addison entered into rest Friday March 15, 2019 at Prisma Health Richland, Columbia, SC. Additional survivors include her brother, Johnathon Bledsoe, Aiken; maternal grandparents, Emma Abney, Martinez, GA and Cleveland Abney, Johnston; paternal grandparents, Larry and Lynn Bledsoe, Aiken; two aunts, Michelle (Mac) McCord, Graniteville, Krystle (Cliff) Abney, Johnston; one uncle, Tim Bullard, Charlotte, NC. Pallbearers will be Johnathon Bledsoe, Clifton Long, Karsyn Rawls, Andrew McCord. But Jesus said, “Let the little children come to me and do not hinder them, for to such belongs the kingdom of heaven” Matthew 19:14. A visitation with the family will take place 6-8 pm Wednesday March 20, 2019 at COLE FUNERAL HOME 1544 UNIVERSITY PARKWAY (118 BY PASS) AIKEN, SC 29801. 802-648-7175. Please sign the online registry at www.colefuneralhomeinc.com.